All that’s not the prelude to mockery, because the record shouldn’t be judged on the basis of the openly uncertain conclusion. 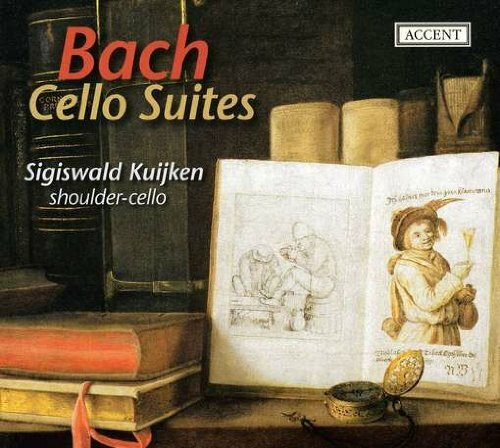 Kuijken—unlike elsewhere in the field of historically performed argument on Bach’s style—doesn’t claim that the suites were certainly written for, or only played on, the shoulder cello. He merely suggests, and convincingly in that limited sense, that it might be a possibility. And he delivers the acoustic document to check out that possibility. It’s a document that rises far above being a mere curiosity-demonstration. Even if I am right in presuming that Kuijken didn’t become, in some Platonic-ideal sense, the best possible shoulder cello player over night, his rich and generous sounding instrument (A≈415Hz) and his extraordinarily cheery, enlivening performance are a true pleasure to behold. The tone is beautiful, if not in the conventional cello sense (he ‘milks’ his instrument less); his intonation impeccable (a legitimate concern for vibrato-eschewing HIP performances). The acoustics on the Accent recording are superb—rich enough to give him his instrument some sheen and aura, but not detectable as distance or reverberation. His tempi moderate throughout, if anything marginally on the fast side, since Kuijken never gives in to the temptation of luxuriously lingering. With this recording Kuijken offers something genuinely different, genuinely interesting, and wholly charming: not at all just a curiosity but a keeper. You might be interested to know that two additional recordings are available of the cello suites played on violoncello da spalla: by Ryo Terakado (on Denon) and by Dmitry Badiarov, the luthier who builds these instruments (on the Ramée label).